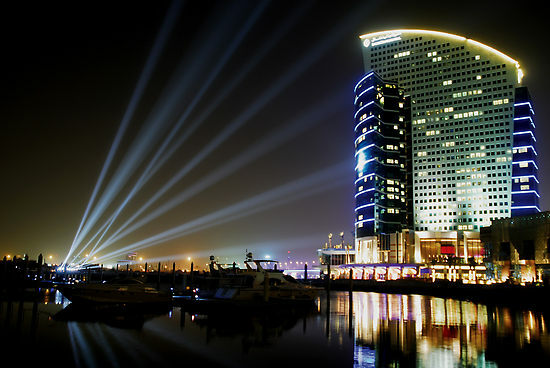 A MODERN LANDMARK ON HISTORIC DUBAI CREEK Inspired by a graceful sailboat, InterContinental Dubai Festival City stands tall amid the local business and shopping districts. If you’re in town on business you’ll appreciate the proximity to Burj Dubai, the Business Bay and Dubai World Trade Centre. Bastakiya, Dubai Museum and Al Mamzar Beach Park are nearby, which means InterContinental Dubai Festival City has as much to offer the leisure seeker as it does the business traveller. The hotel is home to four dynamic restaurants and two stylish bars, all with acclaimed views of the Dubai skyline.